In year 2016 Slovenian tourism reached a record growth of the visits and above-average growth of overnight stays in Ljubljana for several years in a row. Figures for January prove that the year of 2017 might bring even greater results. Panorama of the Slovenian capital Ljubljana at sunset. 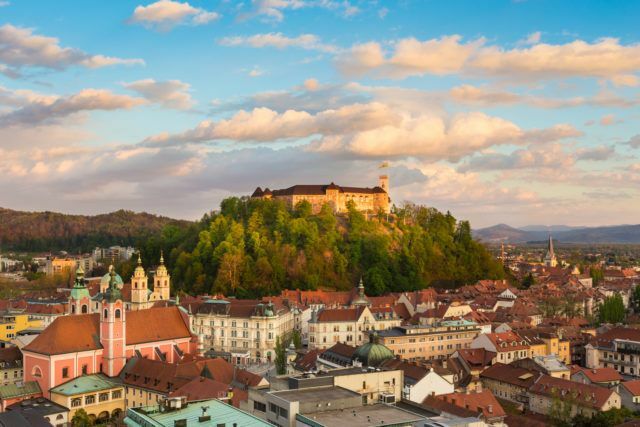 Ljubljana had another record year – in statistical terms and in the terms of content. In the year of 2016 the city was marked by the prestigious title of the European Green Capital, when a number of new products and experiences were created. The boundary line of million overnight stays was achieved in September and the year was concluded with record numbers and new challenges. Guests in Ljubljana made 1,274,183 overnight stays in the year 2016, which represents a 9 percent increase compared to the year 2015. The beginning of the year 2017 continues with record figures. Based on the evaluation of Ljubljana Tourism in January 2017, guests completed 63,743 overnight stays, which represents 10 percent more overnight stays compared to the January last year (official data for January 2016 for facilities with at least 10 beds: 58,082 nights; source Statistical Office of the Republic of Slovenia). The results for January regarding the scope of nights for the weakest month is encouraging, especially since this year’s growth exceeded the already excellent January last year. The strengthening trend of the off-season months is also continuing.